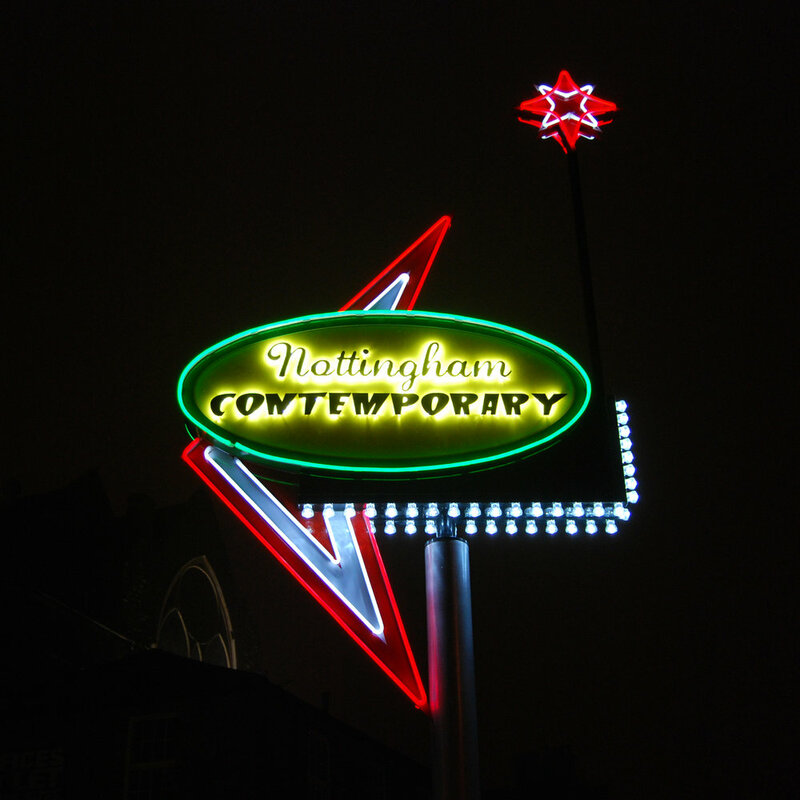 Prior to their launch, Nottingham Contemporary came up with the idea that rather than having a single branding or logo for the gallery, they would commission fifteen artists to design logos, with a commitment to use all of them. The full list of artists is Ben Cain, Ryan Gander, Klaus Weber, Chris Evans, Anthea Hamilton, Vidya Gastaldon, Ben Cain, Chris Evans, Ryan Gander, Vidya Gastaldon, Loris Gréaud, Anthea Hamilton, Evan Holloway, Flavia Muller Medicos, Benoit Plateus, Olivia Plender, Lucy Skaer, Sturtevant, Klaus Weber and Pae White. Drawing on a longstanding interest in Googie architecture - a radical and forward thinking architecture that was never the preserve of the wealthy or exclusive, but used almost exclusively for diners, motels, banks car washes and other public buildings - this design nods to those stylings of the American West coast. Following a conversation between the gallery's architects, Caruso St John and, then Director, Alex Farquharson, the decision was made to fully realise the logos potential and it was commissioned to be sited, permanently outside the building.